There was, once upon a time, an era in which the biggest college football game of the year was played on the last weekend in November. It was the game between Army and Navy, played at Philadelphia Stadium, attracting well over 100,000 people each season. The teams were perennially among the best in the nation; Army won the national championship in 1944 and 1945, while Navy finished the 1963 season ranked #2, and in the twenty years between 1945 and 1965 the two schools combined to produce five Heisman Trophy winners. 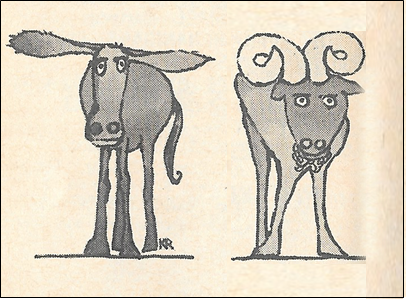 By 1965, however, things had changed. For one thing the venue in which the game was played, although it was the same stadium, was now called John F. Kennedy Memorial Stadium. For another, the two teams had started their long decline into football irrelevance. The symptoms weren't readily apparent; the 1965 teams were said to have had "disappointing" seasons (4-5 for Army; 4-4-1 for Navy, who'd lost Roger Staubach to graduation the previous year), and a crowd of 102,000 was expected, including President Lyndon B. Johnson. The teams played to a 7-7 tie. It seems as if we're always talking about how dramatically televised sports has changed over the years, and here's another example. Later that Saturday afternoon, CBS's NFL Countdown features live reports on the "NFL college-player draft," being held at the Summit Hotel in New York. You'll note first of all that the draft is being held in November, rather than April of the following year. It's not only before the end of the college season, it's also before the NFL season ends. Today, of course, the draft is a TV spectacle, with two nights of prime-time coverage on three separate networks (ESPN, NFL Network, and Fox). Draft parties are held in cities throughout the country, and TV draft experts are a cottage industry. But that's not to say that the pro football draft in the 1960s was without drama. * For one thing, the NFL had competition from the AFL. Each league held their own draft, with the result that most of the top players were drafted by a team from each league. The battle to sign the top draft picks was fierce, and stories abounded of scouts from one league hiding players in hotel rooms under fake names, spiriting them away in the trunks of cars, and doing anything they could to keep them away from their rivals in the other league. Many college players made a ceremony of coming to terms with a professional team, often signing the contract under the goal posts after their final college game. (Some others, of course, signed before their final game, but that's another story for another time). With the increased competition came, naturally, increased salaries, which went through the roof. This ended in 1967, when as a precursor to the NFL-AFL merger the two leagues for the first time held a common draft, in which all teams took part, alternating picks. It was an end to the bidding war between the leagues, although the era of big-money contracts was here to stay. *Not to be confused with the military draft, drama of a different kind altogether. Sullivan: Ed's scheduled guests are Victor Borge, songstress Petula Clark, musical-comedy star Sally Ann Howes, singer Glen Yarbrough, comedian Jackie Vernon, band leader Sammy Kaye, the 1965 Look Magazine All-America football team, juggler Rudi Schweitzer and the Little Angels of Korea, children's choir. Palace: Hostess Janet Leigh welcomes song parodist Allan Sherman; F-Troop's Forrest Tucker, Ken Berry and Larry Storch; the comedy team of Rowan and Martin; singer Andy Russell; table-tennis champion Bob Ashley; and magician Michael de la Vega. The F-Troop gang is funny (especially Larry Storch), and Rowan and Martin (in their pre-Laugh-In) days were all right, but ultimately I think Ed has the edge. The verdict: Sullivan, by a nose. There is a birthline, Cleveland Amory says, one that started with The Beverly Hillbillies, from which came Petticoat Junction, and now has grown to include Green Acres. And if it is the place to be, as the theme song says, the question remains as to whether or not it's the place we want to be. There are people we want to be there, however, chief among them Eddie Albert, who handles the role of Oliver Wendell Douglas with "remarkable aplomb," and Eva Gabor, who suffers various indignities—including the show's scripts—with "rare good grace." There's a good supporting player in Pat Buttram, and everyone else involved with the show has their moments. The problem, according to Cleve, resides with the moments taken up by the show. Take the premise, for example—please. The story of the city man who wants to retreat to the farm is already an old and predictable one. And then there are the crossovers from Petticoat Junction. Says Amory ,who is obviously not a fan of the Paul Henning family tree (even though Green Acres was created by Jay Sommers), these characters "have their place, but their place is in Petticoat Junction, and we certainly are not going to tolerate their wondering around the black fences of all our other shows all week." Lest we mistake what Amory's getting at, he sums up his review by saying that "Green Acres should be put to pasture as rapidly as possible." It's been a while since I've watched Green Acres from the beginning, and so I'm at a bit of a loss as to how to read Amory's review. In the years since the show went off the air, Acres has developed a reputation for sophisticated, absurdist humor, one of the best sitcoms of the decade, a show that somehow stands apart from those other Henning shows. Is this a case of the show growing into that role, of Amory catching it in its infancy, before the humor has matured and the "predictable" premise has been harvested in unlikely ways? Or is it that Amory simply doesn't like this kind of show, and that he's bound to hate it no matter when he catches it during its six-season run? In fact, Amory was far from alone in his opinion; "the Boston Herald Traveler's Eleanor Roberts described it as 'so bad it's an insult to the intelligence of a nursery school dropout,' while the Houston Chronicle's Ann Hodges deemed it to be 'possibly the worst show I've ever seen.' 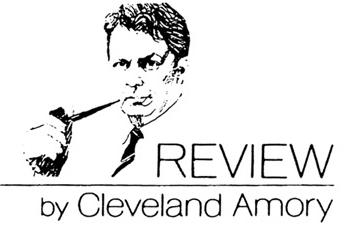 In a letter to a Nashville paper, one viewer said it was 'the most degrading thing I ever saw' and an Akron viewer called it 'the most vile program on television.'" Whatever the case, opinion is a subjective thing, while TV ratings are objective, and objectively speaking, Green Acres was a hit throughout its six seasons, falling victim not to a shrinking audience, but the wrong kind of audience. Plus ça change, plus c'est la même chose. There's a distinct military theme to this week's issue; in addition to Army-Navy, there's a feature on how newsmen are covering the growing conflict in Vietnam. 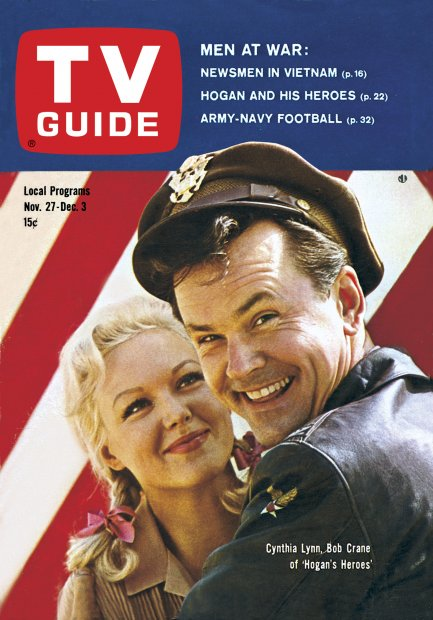 And then there's Leslie Raddatz's cover story, on Bob Crane and his new series Hogan's Heroes. You can tell there's still some uncertainty about staging a sitcom in a POW camp, although several cast members make the point (with which I agree) that there's a big difference between a POW camp and a concentration camp, which would have been strictly off-limits. 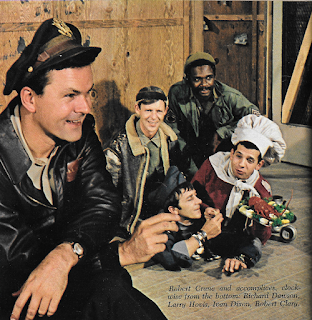 We know, for example, that Bob Crane showed a preview of Hogan to a veteran's group to make sure they weren't offended by it, before he'd go ahead with the series. Crane's co-stars, Werner Klemperer (Klink) and John Banner (Schultz) are firm in their endorsement of the show; Klemperer, who's played many a villain in the movies (including the notorious Adolf Eichmann), says that comedy is "the sort of acting I prefer. It's a tremendous relief." Banner, an Austrian Jew who fled Europe when the Nazis invaded, is even more adamant in defending Hogan's concept, stressing that one must not confuse POW camps with concentration camps. "It's wonderful to be able to laugh again," he says, echoing Klemperer. "A program like this shows that the mind is stronger than all the weapons in the world—that even in a totalitarian country individualism sneaks through." Liza's mom, Judy Garland, is still alive at this point, and Liza has a boyfriend,* soon-to-be-husband Peter Allen. As for Liza herself, she says movies hold no excitement for her, that performing before a live audience is where it's all at. Interesting, since some of her greatest fame has come from movies: The Sterile Cuckoo, Cabaret, and Arthur. Oh, well - times change. *Or should that be "boyfriend"? 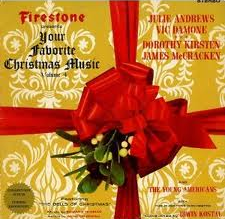 It's not a Christmas special per se, but Julie Andrews does have a Christmas album coming out, and there's no better way to promote it than to appear on television, even if you're not going to sing anything from it. (The period between Thanksgiving and Christmas has always been a fertile period for specials, seasonal and non-seasonal alike.) It's billed as "The Program All America Has Been Waiting For," although I don't recall having been in a fevered rush to see it. Anyway, her NBC special was probably quite good, with her special guest Gene Kelly. (And, in smaller print, The New Christy Minstrels.) Now, I could've included a picture of the close-up from TVG, but this album cover is so colorful I decided to use it instead. Other interesting odds and ends for the week: the Saturday matinee movie, Hellcats of the Navy, featuring the future President of the United States and his wife, Nancy, in her next-to-last role. The King Family has their Thanksgiving show, which thanks to the vagueries of local stations that show programs from multiple networks, is shown the week after Thanksgiving. A Sunday afternoon NBC news special entitled "Who Shall Live" explores the process of determining which patients on the waiting list will get available organ transplants. Andy Williams' special guest on Monday night is Richard Chamberlain, star of Dr. Kildare, which conveniently airs in the slot immediately before Andy. Liza Minnelli's back on Wednesday night in another special, CBS's Ice Capades of 1966, hosted by Arthur Godfrey and featuring Roger Miller - I think it's safe to say none of the three do their performing on ice. There's an ad for the "John F. Kennedy" 1964 coin sets, featuring the brand-new Kennedy half-dollar, a great Christmas gift for a member of your family. Three months after retiring as manager of the New York Mets, Casey Stengel is Hugh Downs' guest on Today. And there's a brief obituary of Allen B. DuMont, one of television's unsung pioneers, who'd died two weeks before. The show does have a reputation for being surreal, strange and honest-to-goodness funny. That begins later in the first season and really kicks in during the second. Those reviewers may have preferred the show then. At this point in history, I can't honestly say that I give two hoots about what they thought. (It's like the critics who blame Sylvester McCoy's Doctor for tanking DOCTOR WHO in 1989. 1: That's baloney. 2: Get over it.) But, I do love how vehemently they hated it. Watch the second episode: Lisa's First Day On The Farm. It is slow, methodical and oh so funny. (Junction re-created it a few years later when Betty Jo and Steve explore their future home.) The fact that they couldn't see that it was funny, which was the purpose, means maybe they were too inundated with sitcoms at that time to differentiate one from the other. Maybe? I don't know. As someone who writes about TV shows and movies, if I find that I can't tell good from bad because I'm knee deep in some genre or other, I step away. At that point, I'm not doing it right, as far as I'm concerned. GREEN ACRES is a brilliant show. I could name 30 episodes (or more) that will make you laugh again and again. Unfortunately, that stigma stuck with the show for quite some time. I started watching it in November 1985. I fell in love with it immediately. (On an afternoon roster with HAZEL and FATHER KNOWS BEST. There's a lineup!) But, Rick Mitz's THE GREAT TV SITCOM BOOK, which is from the first half of the 1980s, treated it like garbage. However, as the 1980s went along, people actually began to watch it and appreciate it. 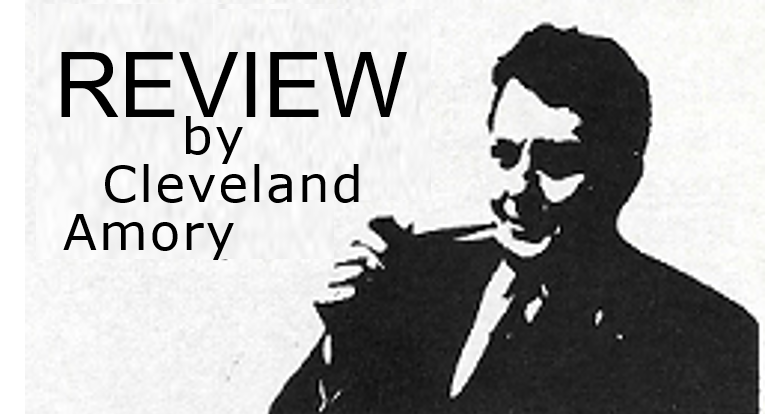 John Javna's CULT TV and TELEVISION COMEDY SERIES by Eisner and Krinsky both loved it. As I did. It's one of the best American sitcoms ever. And I will fight anyone who says otherwise.